StudioCloud Mobile is the amazing tool that allows you to access all of your StudioCloud information right from your iPhone, BlackBerry, or any other Internet enabled mobile device. Every user of StudioCloud who has CloudBoost or EmployeeBoost has access to this great feature! Using StudioCloud mobile is simple, easy, and effective! If you find yourself lost on your way to an appointment, quickly log into StudioCloud Mobile and access your events for that day. If you've entered in the event address in the notes section, you can map the way to your destination. One of the best features of StudioCloud Mobile is the ability to create clients and prospective clients. With this feature, if you ever meet someone who may be a potential customer, you can quickly and easily save their contact information to your StudioCloud account using your mobile phone. It's just that easy! 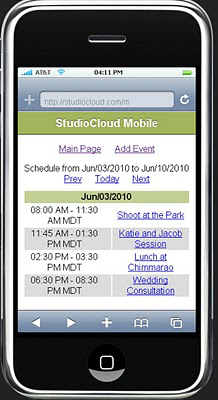 Take advantage of this wonderful feature by going to www.studiocloud.com/m on your Internet enabled mobile device.